I BOUGHT a dishwasher last week. It’s shiny and silver, and it has five different wash cycles and an internal heat fan and buttons that light up. It’s my first ever dishwasher, and it’s fantastic. It’s also currently sitting in a cardboard box somewhere – possibly on a container ship in the middle of the ocean, or maybe on a factory floor in Shenzhen underneath a sign that says ‘‘for dispatch’’ in Mandarin – and has been for the past two weeks. And unless someone pays attention to that sign some time soon or speeds up that boat, I expect it will remain so – for a further three – at least that’s what the store I bought it from tells me. That’s five weeks to get a dishwasher from a shop down the road into my kitchen. I suspect it would be quicker to study advanced electronics and build my own. Not only am I waiting more than a month to get my shiny new appliance, but I’m also currently in a three-week long queue to see an eye specialist. It’s taken me two weeks to get in to see the dentist and I’m halfway through a four-week wait to get the internet connected. And I am about to tear my hair out. It’s a feeling similar to road rage, only without the car. Or the road. Just the rage. Boiling, red-hot wait-rage. Now, I know that having been born in 1980 I’m technically a member of Generation Y, which basically means I use Facebook a lot and have a short attention sp... LOOK AT THAT BIRD! But I’m sure it’s not just 20-somethings like me who think waiting for anything these days is beyond the pale. 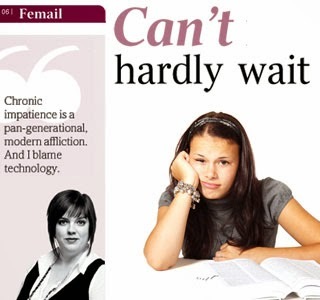 Chronic impatience is a pangenerational, modern affliction. And I blame technology. We weren’t like this 15 years ago. You want to write a message to someone? Put pen to paper, whack it in an envelope, stick it in the big red box and wait a few days. You want an answer to a question? Go to the library, take the time to look it up in a book. You need to talk to someone? Call them at home. If they don’t answer, it’s because they’re out. So wait. Then call them again. Back in 1995 if you arranged to meet friends somewhere and they were late, you had to wait. You couldn’t just move on and text them to say you were going to a different place, meet you later. How did we all cope with that? These days it’s just unthinkable. on our phone – that it drives us mad when things take any longer than ‘‘immediately’’. It seems wrong to be this way, to feel aggrieved when things don’t happen exactly when we want them to. It seems childish and petulant. Something we should all be above. Perhaps we all need to cast our minds back a decade, remember how we used to cope with waiting just fine, and relax a little more. First published in the Sunday Mail, September 26, 2010.